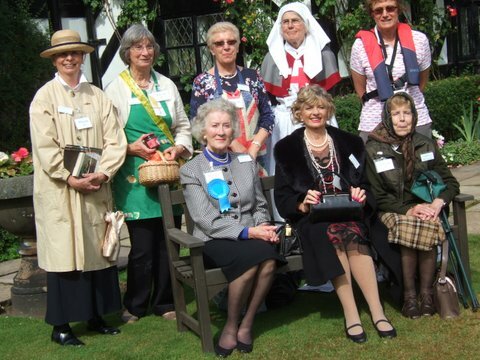 On Tuesday the seventh and Wednesday the eighth of July, the CFWI celebrated its ninety-fifth birthday at Gawsworth Hall, Macclesfield, the home of the Richards family. The event was originally scheduled for one day, the Wednesday, but due to the unprecedented number of members applying, two thousand, two hundred in total, the event was held on two days. Twenty-one members of Kelsall WI attended on the Tuesday, and the day did not look auspicious when we arrived in a torrential downpour. Rather than venture out in the rain, we decided to have our lunch in the car, after which we made our way to the gates, which opened at twelve-thirty. Fortunately, from that time on, the rain stayed away, much to collective relief! The WIs attending had been asked to put on a ten minute entertainment piece; a great deal of time, effort and hilarity had gone into the preparation, of Kelsall’s offering- Inspiring Women of the Last One Hundred Years. The inspiring women-The Queen (Sandra Bell), Margaret Thatcher (Peggy Grimshaw), Lady Denman (Liz Baskerville), Dame Laura Knight (Margaret Davies), Delia Smith (Marian Nicholas), Edith Cavell (Mary Diggle), Mary Berry (Janet Herdman) and Dame Ellen MacArthur (Pat Symms, whose suggestion this was) -performed twice before a large audience. The idea was for the audience to guess the identity of the famous ladies, and then each “actress “ to give a short account of the inspiring woman’s life. This was very successful and was much enjoyed on each occasion. During this first afternoon of the two days’ celebration, there were two further entertainment pieces, each performed twice. There was a series of very amusing sketches given by the CFWI executive, and a collection of songs performed by the /////////WI. During the afternoon, we were given a chance to look around the beautiful house, dating from 1480, and the grounds. In the marquee, there were displays of the various WI banners made for the NFWI One Hundred Years, and we were treated to a glass of fizz and a piece of birthday cake. 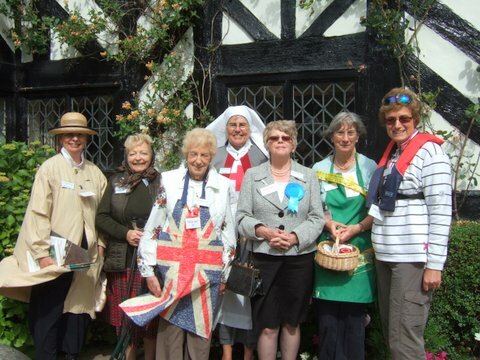 The Kelsall ladies performed their Inspiring Women of the Last One Hundred Years again on Wednesday, twice, the only WI to perform on both days. This time, we were without our Lady Denman, and Chris Stelfox played the Queen, as originally planned, and Anne Tonge ‘did’ Margaret Thatcher. Dot Berry played her namesake, Mary Berry. The very large audience was entertained by a number of Cheshire WIs this time, singing being the most popular form of entertainment, interspersed with one or two comedy sketches, rounded off by the excellent Weaver Valley WI Choir. All the performances were done twice, as there were so many ladies present, there being more on the Wednesday than the Tuesday. In fact, I am told there were thirty-eight coaches booked in to arrive on that day! The two days of celebration were extremely successful. We were in beautiful surroundings, the weather remained fine, mostly, and the entertainment was very enjoyable. The re-organisation of the event from one to two days had caused a huge ‘headache’ for the organisers, and I am sure that everyone was extremely relieved that the CFWI Ninety- Fifth Birthday Celebration had been extremely successful. The Inspiring Women of Tuesday afternoon. Wednesday afternoon's inspiring women. Spot the changes!